Are We Downhearted, this Norman Rockwell painting, appeared on the cover of Life Magazine published November 28, 1918. 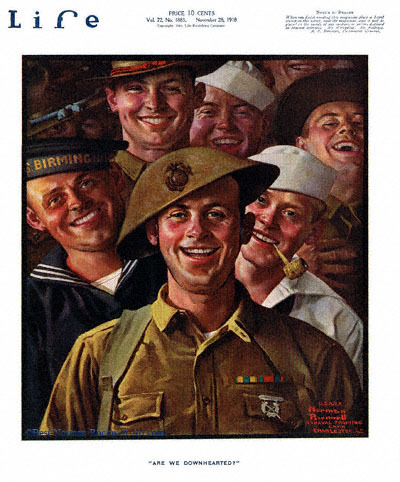 An alternate title for this illustration is Group of Smiling Soldiers' Faces. This was the thirteenth cover by Rockwell to appear on Life Magazine. A Rockwell painting appeared on Life magazine's cover a total of ten times in 1918 and twenty-eight times in all. In this painting, Norman Rockwell attempts to show his audience that morale has remained high in all branches of the service. At this point in time, World War One is ending. An armistice is being signed. Some soldiers and sailors are returning home. Why wouldn't morale be high under those conditions! There's nothing like seeing your sweetheart or mother to lift a young man's spirits. We can see six happy faces and partial views of two more. One soldier is even laughing. Perhaps the setting for this painting is an embarkation station or a troop transport on the way back home. That would explain the jovial expressions.